SADLY, IT IS A MAJOR LOSS FOR STRUGGLING RISTORANTE GAJA. 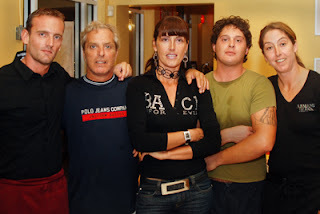 BIANCHI'S IS OWNED BY CHRISSY BIANCHI-RABIL AND FADI RABIL, WHO ALSO OWN THREE CHRISSY'S RESTAURANTS. THE BELOW IS LEFT FOR HISTORICAL INTEREST, AS CHEF GINO, AND HIS STYLE, ARE NO LONGER AT GAJA. Chef Gino Sciallis opened Gaja in October, 2007, where Il Posto was located in the 3rd Streen Plaza, just west of bustling 3rd Street. He cooks authentic Italian, hailing from Italy's Piedmont region, then moved to Sanremo, in Liguria, on the Mediterranean Sea. (No wonder he'd feel at home next in Naples, Fla, with it's , um, abundance of Italianate-morphed-Tropical Style architecture.) 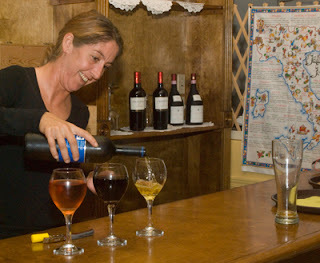 All of the staff, his grown children from Italy, take care of the "front of the house" with their attentive service, warm smiles and wonderful accents. He cooks with a "light touch", a high compliment, meaning that food is cooked just right, and not 30 seconds too long. 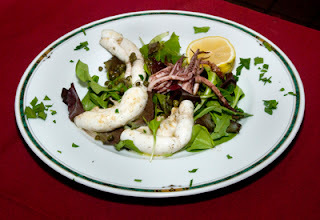 The spicing is just enough to accent the food, be it Calamari Alla Griglia, or Grilled Calamari, served over mixed Greens with Capers, Lemon and Virgin olive oil ($12.95), a Fettuccine Dell "Orto, or the Shrimp, Zucchini, Eggplant, and fresh Tomato and Basil ($21.95). I went for the bouillabaisse style Zuppa di Pesci, with tender clams, fresh mussels, sweet shrimp, calamari and fish in a savory seafood tomato broth with crostini ($28.95). 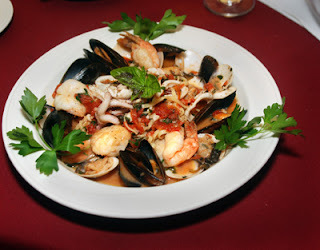 Each morsel of seafood was so tender, and complemented by the rich, yet delicately seasoned tomato broth. A peek in the kitchen revealed no cans of food, just fresh produce and lush herbs from his own garden, and, yes, it tastes just as refreshingly typical as the food I had in Italy. I usually take home a portion of my food-here I was all too eager to savor (and devour) all these fruits of the sea while hot, and with extra crostini! It's a pleasure to dine with a glass of wine, linen tablecloths, and abundant fresh food, quietly close by Naples 3rd Street shopping. 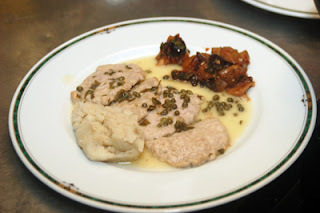 I will try the Saltimbocca Alla Romana next time- a Veal Scaloppine sauteed with prosciutto, sage, and white wine, served over spinach ($24.95). 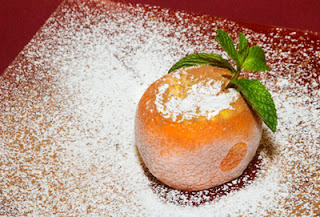 For dessert, I quickly "disappeared" the naturally sweet, yet slightly tart Orange Sorbet, served in a frozen orange, with a sprig of basil and a dusting of confectioner's sugar. Mmmmm! I've had several people from this blog enjoy Gino's, and call me to say so. Gino will soon have a line forming as word gets around that Naples finally has a Great Italian Restaurant that stands above the other 40 or so "ok" Italian restaurants that have been resting on their basil leaves. If you are salt-conscious, this cuisine may salt a little generously, true Italian style, which is a little bit more salty than Naples restaurants may serve. Let your server know if your diet merits a lighter hand on salting. Gino, you've received enthusiastic votes for "The Best Italian Restaurant in Town", after only a few months cooking at this site. Mangia! There's live entertaiment outdoors, Thursday to Saturday. 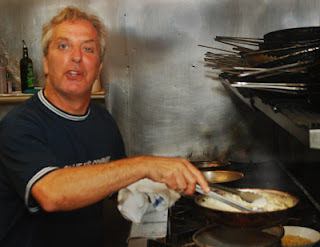 Chef Gino also sings Rolling Stones songs while in the kitchen- your call- eat al fresco, or be serenaded by the kitchen. Such a choice! 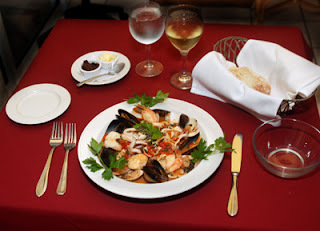 It is one of the best authentic Italian restaurants in the area bar none! He's the best! And so is the food! Does anyone know what their website is? 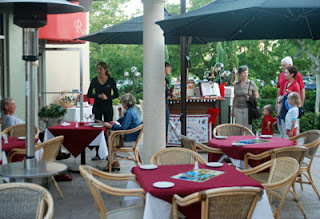 We loved Gino's cooking in Marco and have followed him to his new "home" in Naples. Thank goodness he didn't move farther. Gaja's is the best "Under the Radar" restaurant in town-spread the word! 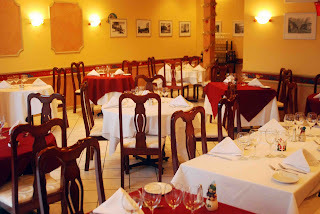 Gaja Ristorante - exquisite italian cuisine from Gino in a romantic and light-hearted atmosphere in the heart of Naples - it really doesn't get much better than this!